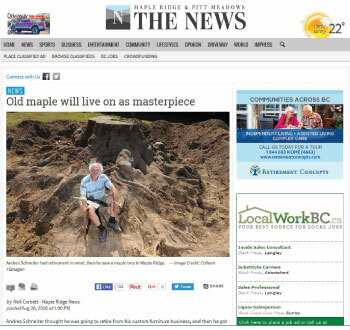 The Mayor’s Office at the City of Port Coquitlam is proud to showcase the craftsmanship of artisan Andres Schneiter, who handcrafted an old-growth tree from our City into a live-edged, custom made desk, credenza and bookshelf and coffee table to celebrate our City’s 100th birthday in 2013. The furniture is a part of our community’s centennial legacy in City Hall and so it was very important that these pieces were extraordinary. The work done by Andres at MapleArt Custom Furniture is extraordinary and every guest that visits my office compliments the natural look and beauty of the furniture. I hope you have the opportunity to enjoy a piece of work from MapleArt Custom Furniture as much as we do! Wanted to again pass along a big Thank You from Conifex for the 15ft Big Leaf Maple boardroom table you created for our downtown office. We worked closely with MapleArt Custom Furniture to design a beautiful custom boardroom table for our Grouse River project. The feature piece was to exhibit live edges and an interesting form, was to seat 12 people, and provide in-table power and data receptacles. Andres’ attention to detail and love for his work is evident, and the whole experience was an enjoyable one. 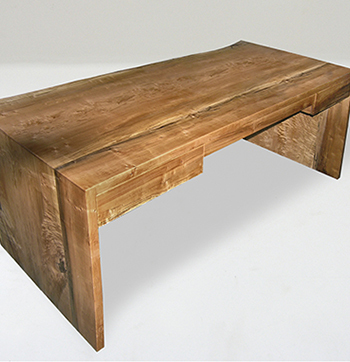 We would recommend MapleArt to anyone looking for a unique, handcrafted and stunning piece of wood furniture. You made the whole process very enjoyable for us. Iris and I are convinced that no amount could buy us a better fit between design, artist, and craftsmanship. You put your heart into this project. The table is beautiful, but the thing I still can’t get my excitement over with is how the chairs came out – they are gorgeous. In the mail there is a thank you extra bonus check for $1,000. Thank you for the nice beds and night tables you designed and made for our boys. With the inlays and interesting grain, they look great. We really appreciated the walk into the forest to show the boys where the tree for their beds grew. 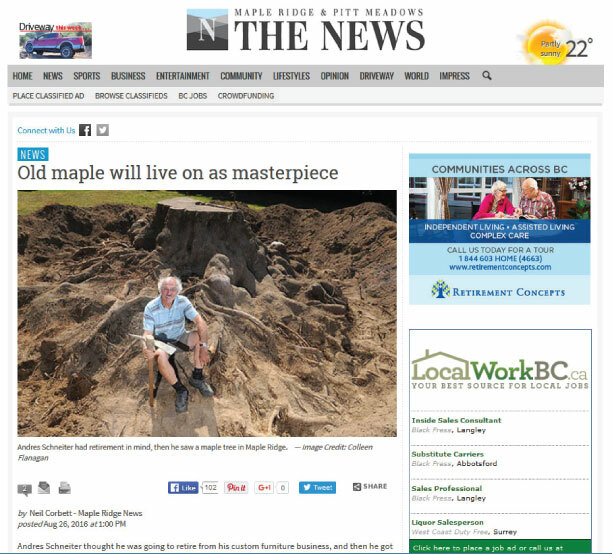 “Andres Schneiter thought he was going to retire from his custom furniture business, and then he got the tree of a lifetime – the biggest maple tree in Maple Ridge. When he was a university student learning about industrial design in Switzerland, Andres Schneiter was subjected to strict discipline from his instructors. Papers had to be stacked neatly, tools put away…. The training in proper processes would serve him well through a 25-year career in telecommunications. Schneiter had already been a longtime hobbyist when it came to making wooden furniture, but he decided to devote himself to the pursuit full time after the telecom industry crashed in the early 2000s. 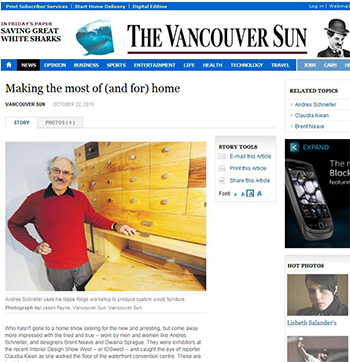 Andres Schneiter spent 25 years working in telecommunications, but was a longtime hobbyist in the making of wooden furniture. When the telecom industry crashed in the early 2000s, he turned that hobby into a full-time pursuit. As he crafts his furniture from maple wood, Andres Schneiter aims to make his pieces with as clean lines as possible so that it almost appears to float. His designs look simple and to make them, he combines engineering and art. But the simpler the piece of furniture, the more complicated it is to make. Who hasn’t gone to a home show looking for the new and arresting, but come away more impressed with the tried and true – work by men and women like Andres Schneiter, and designers Brent Neave and Dwaina Sprague. If you’re conversant in German, you may wish to hear Andres discuss his work in this interview from the Swiss radio station DRS 1. The interview starts just after the Bruce Springstein song. It may take a few minutes after you click the link for the interview to start playing on your computer.